This crunchy little supplement clocks in at 12 pages, 1 page front cover, 1 page editorial, 1 page taken up by an old, but nice stock-art piece, 1 page SRD, 1 page back cover, leaving us with 7 pages of material, so let’s take a look! After an introduction, we begin with the one cantrip herein – that would be Quench, which falls firmly into the utility region and does what it says on the tin, with higher levels allowing for the extinguishing of far away fires or bigger ones nearby. Nice one. The pdf has 2 different utility spell: Arcane Eye. Yes, the beloved I-spy-with-my-little-eye favorite of any wizard-operator finally makes its way to 13th Age, at 3rd level, with upgrades for 5th, 7th and 9th level provided and a concisely defined limit regarding range and speed, as well as AC and PD. The new 5th level utility spell herein would be another classic – Wall of Stone. This one completely blocks out Adventurer tier characters, allowing only champion tier and up to break through or scale it, which isn’t a solution I enjoy. Why not work with modifications to the DC to prevent the wall from being breached based on the assailants? Both are ranged spells, btw. For 1st level, we once more have two spells that scale at 3rd, 5th, 7th and 9th level, the first of which would be two rolled in one: Enlarge/Shrink Object. The basic idea here is simple – double or halve the size, with Intelligence + Level vs. PD of holding person to resist. Now, where things become interesting, is with the different level-upgrades, where penalties and enlarged items rendering targets stuck making for really creative tweaks of the 13th Age game, setting the spell apart from its other incarnations across the different game-engines. This spell has no feat-based options. The second 1st level spell is another cult classic: Mirror Image. It’s codified as close range, and, on a natural odd hit, one of the 1d2 doubles are hit instead and wink out of existence, with higher levels upgrading the number and providing for means to take crits automatically or adding the escalation die’s halved value (I assume, rounded down) to the doubles created. The Adventurer feat nets a chance for recharges of the spell after battle, while Champion tier’s feat’s images can execute basic melee attacks that inflict psychic damage. Epic feat mirror doubles detonate. Sooo…I’m kinda torn here. Oddly, this spell can make hits inflict more damage than misses, which is a bit strange and an aesthetic choice I am not too fond of. We also have two 3rd-level spells, the first of which would be the ranged spell Snowball Swarm, which may be recklessly cast for +1d3 targets, but a chance that allies may be hit. On the plus side, targets hit by such a cast may also be dazed on a failed easy save. Damage scaling is solid compared to e.g. Force Salvo and the thing that sets the base version apart from the 5th, 7th and 9th level versions. The three feats for the spell enhance the save for the recklessly cast spell, more targets affected by them, and the epic feat adds a chance to render the targets temporarily helpless. Web is a close-quarter spell and another classic brought to 13th Age. The spell dazes targets and render them stuck, with the escalation die tied to the daze-duration. The 5th, 7th and 9th level versions, we have more reliability for the spell, and it has a short-term natural even miss dazing as well baked into its base engine. The two feats improve the dazed save and add poison-damage-causing spiders to the webbing. Nice tweak here! The 3 5th level spell include Acid Rain, a ranged spell that can render targets vulnerable, with half damage on misses. Champion and Epic feats enhance the vulnerability added to the damage, as well as a target-increase. Two close-quarters spells are provided, with Enlarge/Shrink Creature representing a buff/debuff, respectively, is a bit odd in the pretty hefty benefits for being enlarged, but yeah. It’s still a rather nice classic. Titan’s Fist, another close-range spell, allows yo to target more targets at increasing penalties for doing so. Nice one, though I’d probably cap that based on Intelligence. Damage-wise, this is solid, and the feat-upgrades are nice, adding stuck or flinging a target away – did someone say Bigby? At 7th level, the first classic would be Reverse Gravity, which once more comes with a recklessly cast version for additional targets, at the risk of affecting engaged allies. The spell causes untyped damage, which is somewhat problematic, since its damage metrics are based on Transfer Enchantment (which uses psychic damage), with additionally, more targets affected by Reverse Gravity. Not a fan. Cool, on the other hand – analogue to the CRB’s Haste, we get a Slow spell based on it – it would have been nice to have interaction between these opposed spells, however. Plus-side: If the escalation die’s odd, the effect may persist. Anyways, the final spell is another classic: The 9th level spell would be Prismatic Barriers, which makes good use of damage types of 13th Age and really potent defensive tricks. The epic tier feat lets you expand the barrier by 1d2 allies included and lower-tier targets being really hampered. Editing and formatting are very good on a formal and rules-language level – the presentation is precise. Layout adheres to a nice two-column full-color standard and the pdf sports one amazing, new artwork, and an oddly 1-page version of a classic stock-art piece. The pdf comes fully bookmarked for your convenience, which is a nice thing to see for such a brief pdf. 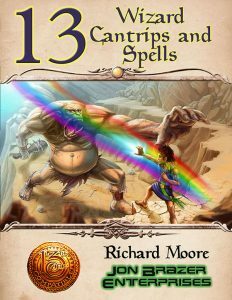 Richard Moore knows his 13th Age – while I do not like every design-decision herein, and while balance is not always meticulous, this pdf should still be considered to be a good buy for all 13th Age Wizard-players, adding some cult-classic spells to the game, often making good use of the diverse options available in 13th Age’s engine. All in all, I consider this to be a good offering, slightly short of the Fighter Talents and Maneuvers presented in the companion pdf. Hence, my final verdict will clock in at 4.5 stars, rounded down for the purpose of this platform. You can get this nice supplement for classic wizard-goodness here on OBS!